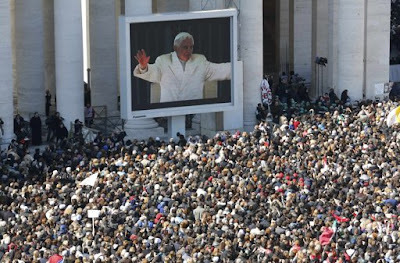 Before a crowd estimated at as many as 200,000, this morning's General Audience saw Benedict XVI's final public event before the first papal resignation since 1294 takes effect at 8pm Rome time tomorrow. 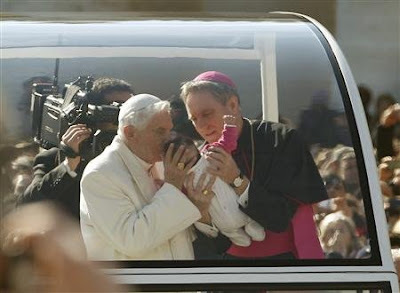 On a cold, but brightly sunny morning, the Popemobile wended around St Peter's Square in one last trip for the departing pontiff to greet the masses in attendance, stopping even today to continue Benedict's longtime practice of giving a kiss and blessing to the babies and toddlers passed over the crowd by attendees. 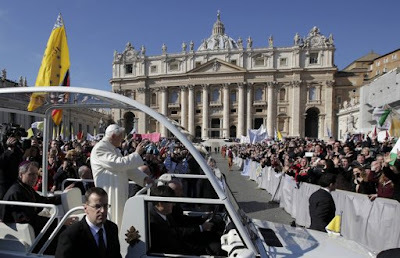 After arriving at the platform on the Sagrato – the steps to St Peter's Basilica – the pontiff broke from both his academic's personality and his policy of the last few weeks in delivering an emotional, introspective "farewell address," during which he laid out his thought process in making the unprecedented decision to leave office. Sitting to Benedict's right, several cardinals – some 60 of whom have already arrived for the transition – were seen in tears during the speech. 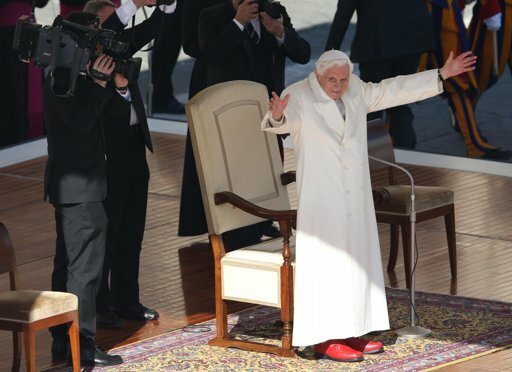 Seeking to keep his messages focused on the faith as opposed to himself, until today, Benedict has referred to his departure almost entirely in passing since announcing the move on February 11th. His final public Mass took place in the basilica two days later, as the church marked Ash Wednesday, and in an Italian interview yesterday the former papal theologian Cardinal Georges Cottier said the pontiff specifically timed the handover to take place amid the penitential atmosphere of Lent. 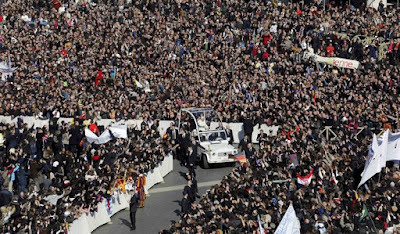 Usually held inside the 7,000-seat Paul VI (Nervi) Hall during Roman Winter, today's audience was moved outside given the anticipated size of the crowd. 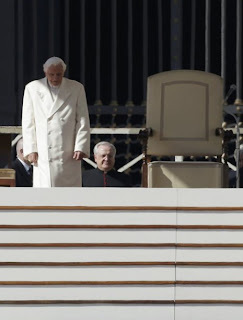 Given to freezing easily, even if his cassock was covered by the full-length the white grecca (overcoat), a white sweater was visible through the Pope's sleeve. 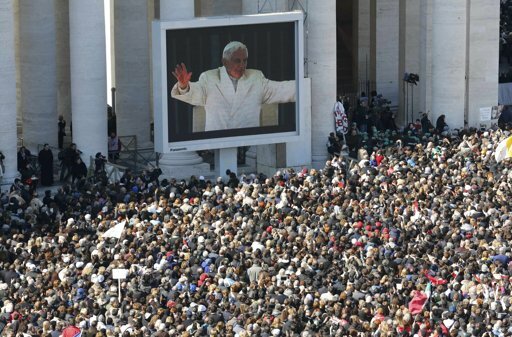 Fullvideo of the event is available on-demand through the Vatican's HD player; Benedict arrives at the 41-minute mark. With the last open event now behind, all that remains on the Pope's schedule is tomorrow morning's thank-you visit with the College of Cardinals before Benedict choppers off into his retirement at 5pm Rome time, three hours before the sede vacante is triggered and Joseph Ratzinger becomes "His Holiness Benedict XVI, The Pope-emeritus" – a styling said to have been his own request. ...and, below, Vatican Radio's English translation of the audience talk – seven years, ten months and nine days since his election, the closing word of B16's ministry as the 265th Pope. The “always” is also a “forever” - there is no returning to private life. My decision to forgo the exercise of active ministry, does not revoke this. I do not return to private life, to a life of travel, meetings, receptions, conferences and so on. I do not abandon the cross, but remain in a new way near to the Crucified Lord. I no longer wield the power of the office for the government of the Church, but in the service of prayer I remain, so to speak, within St. Peter’s bounds. St. Benedict, whose name I bear as Pope, shall be a great example in this for me. He showed us the way to a life which, active or passive, belongs wholly to the work of God. I offer a warm and affectionate greeting to the English-speaking pilgrims and visitors who have joined me for this, my last General Audience. Like Saint Paul, whose words we heard earlier, my heart is filled with thanksgiving to God who ever watches over his Church and her growth in faith and love, and I embrace all of you with joy and gratitude. During this Year of Faith, we have been called to renew our joyful trust in the Lord’s presence in our lives and in the life of the Church. I am personally grateful for his unfailing love and guidance in the eight years since I accepted his call to serve as the Successor of Peter. I am also deeply grateful for the understanding, support and prayers of so many of you, not only here in Rome, but also throughout the world. The decision I have made, after much prayer, is the fruit of a serene trust in God’s will and a deep love of Christ’s Church. I will continue to accompany the Church with my prayers, and I ask each of you to pray for me and for the new Pope. In union with Mary and all the saints, let us entrust ourselves in faith and hope to God, who continues to watch over our lives and to guide the journey of the Church and our world along the paths of history. I commend all of you, with great affection, to his loving care, asking him to strengthen you in the hope which opens our hearts to the fullness of life that he alone can give. To you and your families, I impart my blessing. Thank you!